Exxon is in correction territory, but has an attractive dividend yield. Three years ago, Nymex crude oil traded as high as $107.68 per barrel. A month later, on July 24, 2014, Exxon Mobil (XOM - Get Report) set its all-time intraday high of $104.72. Exxon bottomed on Aug. 22, 2015, at $66.55, as oil continued lower, setting its multiyear intraday low of $26.05 on Feb. 11, 2016. The charts for oil and Exxon correlate well, with the oil giant showing positive leadership as it did between August 2015 and Feb. 2016. One explanation for bottoming leadership by Exxon Mobil is its dividend yield. It is one of the eight "Dogs of the Dow" for 2017 and with the stock down 8% year to date, and having a dividend yield of 3.74%, the stock deserves our attention. Tuesday's daily chart for Exxon Mobil introduces how to measure the risk-reward for the stock using what's known as Fibonacci Retracements. The daily chart below shows four horizontal lines that retraces the stock's decline from its July 2014 high of $104.72 to the Sept. 2015 low of $66.52. The retracement levels are 23.6%, 38.2%, 50% and 61.8%, which typically provide magnets until the stock sets a new high or a new low. Worried about how to pay for your golden years? Ken Fisher, founder of Fisher Investments, and TheStreet's Jim Cramer will tell you what you need to know in a June 21 webinar on the market trends that are shaping retirement planning today. Register here for the event, which starts at 11 a.m. ET. 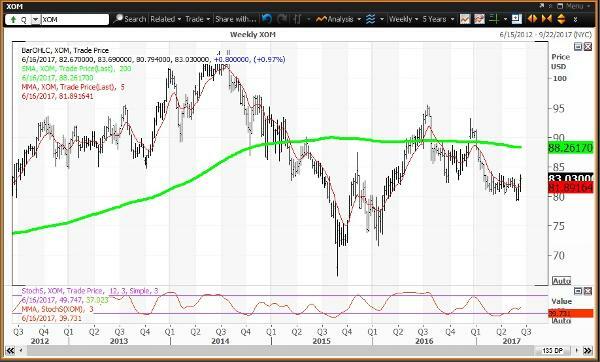 The weekly chart shows the 200-week simple moving average, which is also considered the "reversion to the mean." The weekly chart also shows the five-week modified moving average and a momentum study called the 12x3x3 weekly slow stochastic reading, which scales from 00.00 to 100.00. A reading above 80.00 is overbought, and a reading below 20.00 is oversold. 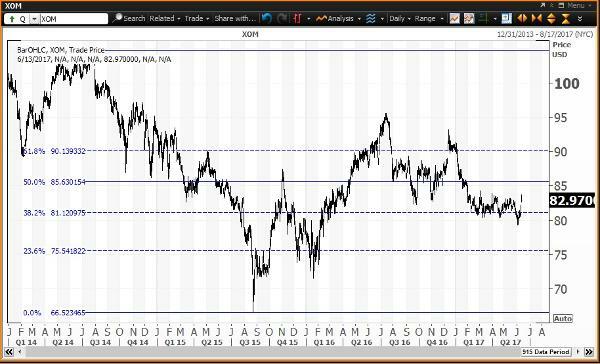 Exxon Mobil quickly rebounded above its 23.6% Fibonacci Retracement of $75.54 as Oct. 2015 began. However, the stock could not sustain strength above its 50% retracement of $85.63 in Nov. 2015. This made the 23.6% retracement at $75.54 a technical support between Dec. 8, 2015 and Feb 3, 2016. The stock peaked at $95.55 on July 15, and the 61.8% retracement became a magnet at $90.14. Notice how the 38.2% retracement of $81.12 has been a magnet since Feb. 22. The weekly chart for Exxon Mobil ended last week positive, with the stock above its five-week modified moving average (in red) at $81.89. The 200-week simple moving average, or "reversion to the mean" (in green) is $88.26. The 12x3x3 weekly slow stochastic reading is projected to rise to 39.66 up from 34.72 on June 2. Current Strategy: To investors who bought Exxon Mobil on weakness to my June value level of $79.55 on June 2. The stock began 2017 with the opportunity to reduce holdings at my annual pivot of $90.11. This annual level is the risky level for the remainder of 2017. Exxon Mobil's shares fell 1.6% to $81.61 in early afternoon trading on Wednesday.